If you’re looking for a personal, inexpensive wedding, look no further than your home or a home of a family member. Here are some tips that will help you have a perfect wedding at home. Assess your guest list – You will want your guests to feel comfortable in your space. 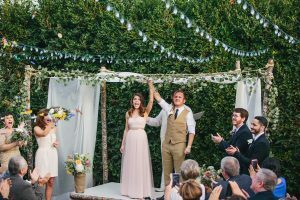 Start by selecting a space for your ceremony, which could be under a shady tree, in the garden or a spacious area of your home. Look at approximately 10-12 square feet of open space per guest for seating at a reception. Longer tables are a better option for narrow spaces or gardens. Lighting – Look at what time you want to have your ceremony and what levels of lighting are available at that time. As the sun sets, consider lanterns, fairy lights or floor lanterns to illuminate your space. Mix and match décor – Mix and match cutlery and crockery to create a shabby chic look that is simple and charming. You can also mix your chairs but create uniformity by placing the same shade of table linen on each table. To reduce costs even further, look at selecting flowers that are in season. You can also mix and match your bridal parties attire, by sticking to the same shade or the same style of attire. Remember the small stuff – Speak to your local enforcement agency and ask them about the noise ordinance rules in your area. You should then plan your wedding schedule according to these restrictions. Start trimming and freshening up your garden early as you will want your garden to look its best on the day. ← How to organize a small, intimate wedding?